Black Bolt Vol. 1: Hard Time isn't just the first volume of Saladin Ahmed and Christian Ward's excellent series about the Inhuman king escaping from a prison in space. It also offers some of the best examples of how to revitalise a well-established, but often ignored and misunderstood legacy character. When you compare him to all of the other god-like kings running around in Marvel's comic books, Black Bolt has always been depicted as a very traditional kind of monarch. Though his silence and superpowers are obviously fantastical, they can be interpreted as being symbolic of the very real burdens and responsibilities that come with the throne. Black Bolt is every bit the traditional king - regal, powerful, and driven by a desire to protect his people, but kingliness has always had the unintended side effect of making him seem incredibly unreliable. In the six issues collected within Hard Time, Ahmed and Ward set out on the ambitious task of breaking Black Bolt down into his most basic self and stripping him of the stately trappings we've traditionally seen him in. In doing so, Black Bolt reveals a level of earnest humanity - no pun intended - in its hero that's been sorely lacking in the past. Trapped in a nightmarish torture prison that's hurtling through space and seemingly powered by an entity that feeds on fear, Black Bolt and a small group of fellow inmates stage an uprising to defeat the Jailer. As straightforward as the prison break story sounds on paper, Black Bolt reads like an exquisite fever dream. Ward illustrates the book's wild, alien setting in a style that vacillates between astringently hard and luxuriously liquid. The cold deadness of deep space is rendered like a swirling, oily, glittering expanse while the bowels of the prison are something like if the world of Tron was infused with powerful magic. Because his powers, which usually keep him from being able to speak, are deactivated for much of the series, Black Bolt is given the opportunity to speak - at length - in a way that's new for the character. 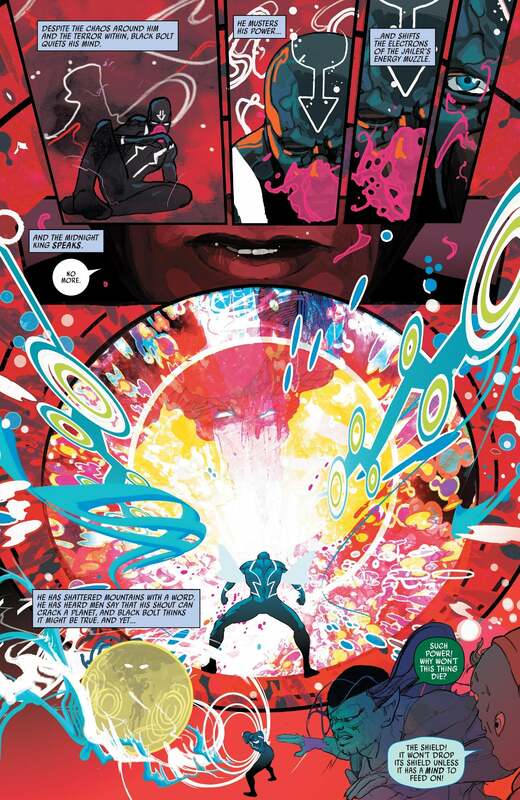 Though we've been privy to his thoughts in previous stories, Black Bolt goes out of its way to dig into how his position of power and his abilities made it almost impossible for readers to get a nuanced idea about who he is as a person. Ahmed's Black Bolt is contemplative about what being a king has done for him - and what it's meant about how others perceive him. Black Bolt's so accustomed to being the kingly, virtuous version of himself in front of others that as the series opens, he's unsure of how to comfortably relate to them. 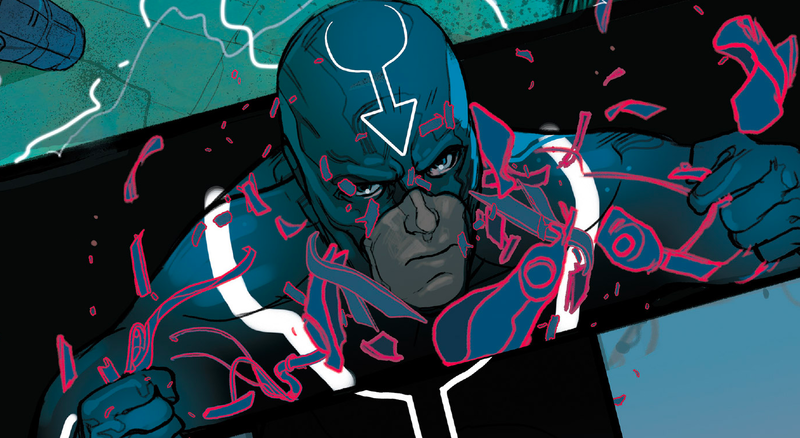 After years of never speaking directly to someone out of fear that he might kill them, Black Bolt eases back into speech in fits and starts, cautiously handling his voice as if it were a loaded gun whose safety he was unsure of. Because the allies that he finds within the prison see him as a person first rather than a king, they're able to engage with him in ways that draw out a novel kind of humanity in him. Black Bolt's stiff awkwardness is contrasted charmingly by Crusher Creel's gruff crassness, and the zest for battle exhibited by Skrull pirate Raave. As prisoners they have all been made equals, and as equals they all recognise that they need one another in order to survive. 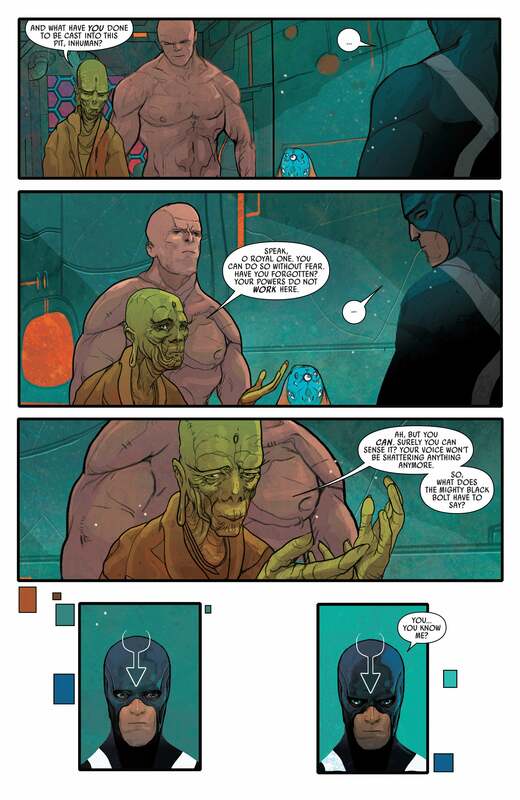 In its careful, deliberate way, Black Bolt reveals that Blackagar Boltagon is, at his core, a gentle, kindhearted man with a complex interiority you know has always been there, but is seldom put on display the way this series does.